We recently posted a survey about ‘Data Deposit’. The survey is still open if you wish to respond. 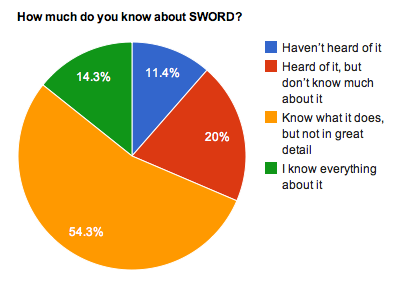 The responses confirm our suspicion that a lot of people have heard of SWORD and know what it does, but a reasonable proportion either haven’t heard of it, or don’t really know much about it. So there is good news, and room for improvement in this result. We’ll post further results from the survey over the next few weeks.